Rising Tide had their 4th Anniversary party on October 26th at their brewery in Portland. I was not able to attend but heard it was a great time. At the event they had lots of food, a pickle competition and released Corvus a hoppy pale ale. I was pleased to find bottles still available when I visited the brewery the following week and grabbed a 4-pack. I quickly realized that one 4-pack was not going to be enough and grabbed another after the Maine Brewers Guild’s Freshman Orientation that was held next door at Coffee by Designs new facility. Bottles of Corvus are probably gone by now but here is what you missed. Typical pale ale appearance with a clear light orange color and bright white head. Aroma and taste are both unique as it moves away from the typical citrus, floral, pine that you get so often with hoppy beers and gives you an interesting mix of other fruits. The description by Rising Tide below says strawberry, honeydew melon, passionfruit, kiwi and grapefruit. I don’t eat a lot of honeydew/passionfruit/kiwi so I can only assume these are the flavors. I also got a little pineapple, no matter what the fruits are this is one unique and very tasty beer. Congrats to Rising Tide on a great first 4 years and I can’t wait to see what they come up with in the next 4 years. 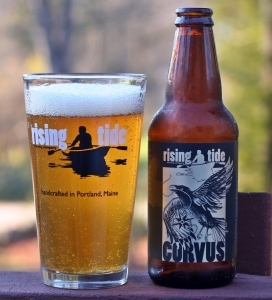 Brewers Description: Brewed in celebration of our 4th year, Corvus features a blend of hops from Germany, Australia, and New Zealand, including Nelson Sauvin, Topaz, Galaxy, and Hüll Melon. Fruity and lightly bitter with notes of strawberry, honeydew melon, passionfruit, kiwi, and grapefruit. May your cup never be out of reach. Three of the next 9 beers I review here will be from Toppling Goliath Brewery in Decorah, Iowa. This is a new brewery to me but I picked up a few bottles in trades over the past few weeks and since they were all pales and IPAs I moved them to the top of my list of beer to drink. pseudoSue appears to be their most popular beer and I can see why. This is a straight up hoppy pale ale; think Mo from Maine Beer Company or Edward from Hill Farmstead. Appearance is an unfiltered orange with a thin white head. Aroma has lots of tropical and citrus fruits. Taste follows but adds some piney hops and a mildly bitter finish. Overall an excellent beer and I bet it is even better at the brewery. This one is worth seeking out if you have a trading partner in their distribution area or are taking a trip in that area. Brewers Description: This single hop pale ale showcases the Citra hop for a well balanced beer that is delicate in body with a mild bitterness in the finish. She roars with ferocious aromas of grapefruit, citrus, mango and evergreen. 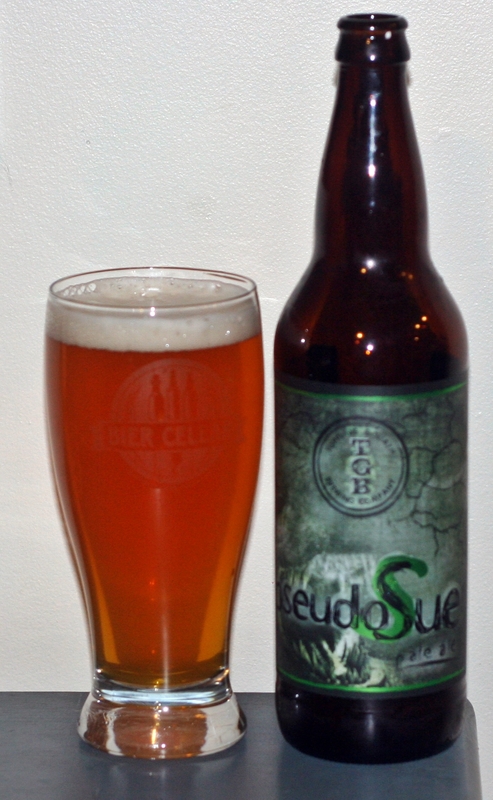 pseudoSue’s unique and addictive taste is clean and bright with just enough bite!